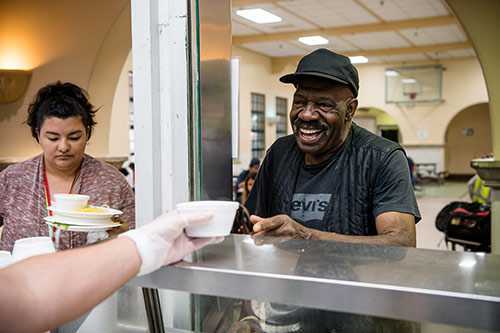 At Father Joe’s Villages, we work to serve more than 1 million meals to homeless men, women and children living in San Diego. Each day, thousands of our homeless neighbors in need can receive a hot, nutritious meal served to them from the Franklin Antonio Public Lunch Program. In San Diego, nearly 480,000 people struggle to put food on the table, and more than 160,000 of those suffering from hunger are children. Numerous studies have found that lack of food is associated with significantly greater odds of hospitalization, higher utilization rates of emergency services and both short- and long-term health problems, including iron deficiency, osteoporosis, delayed cognitive development, and increased risk of cancer. Access to even one meal a day can drastically reduce the likelihood of these consequences. Meals from the Franklin Antonio Public Lunch Program help address this health crisis by providing an average of 1 million meals each year to homeless men, women and children living in San Diego. At Father Joe’s Villages, we offer three daily meals to people living in the Emergency Housing, Bridge Shelters and Transitional Housing programs, and daily lunch for community members in need through the Franklin Antonio Public Lunch Program. We serve meals 365 days per year and use more than 18,000 pounds of food each day. The recipes we use are designed to help clients understand and recognize nutritionally balanced meals, so they can prepare healthy food once they return to homes of their own. For some, the food they receive through the lunch line might be the only meal they receive that day. This meal is especially important because access to warm, nutritious food not only relieves hunger, it can save lives. After Monica’s husband was laid off, her wages alone could not sustain a family of five. While they weren’t making much, they made too much to qualify for food stamps. They defaulted on their mortgage and their house was foreclosed. To add to the situation, Monica’s husband left the family and moved to another state. The circumstances forced Monica and her three daughters to live in her car. Luckily, Monica’s family found the Franklin Antonio Public Lunch Program that offered nutritious and hot meals to them every day. They became regulars in the lunch program at Father Joe’s Villages while they waited for a room. “This place has changed our lives,” Monica said. The family was no longer hungry. For every family like Monica’s that we are able to help, there are a staggering number of those who still go hungry. That’s why the Franklin Antonio Public Lunch Program is crucial to the neighbors in our community experiencing poverty and homelessness. By providing nourishing food to our residents, we empower them to focus on overcoming their struggles and give them the strength they need to achieve a brighter future.